Honduras, which borders Guatemala, El Salvador and Nicaragua in Central America, is home to a number of highly venomous snake species, many of which belong to the pit viper family. Visitors hiking in the jungles and mountains of Honduras should keep a look out for these snakes. Tourists are advised to wear long pants and boots, and to watch where they step. A rare species of palm pit viper, Bothriechis guifarroi, was discovered in northern Honduras in 2010. Named after Honduran environmentalist Don Mario Guifarro, this species had previously been mistaken for another species of palm pit vipers with similarity in appearance. However, it's most closely related to a species found in the Costa Rican mountains. Pit vipers, a group that also includes moccasins and rattle snakes, are highly venomous and possess deep, heat-sensing pits on each side of their heads to detect prey. Barba amarilla, which translates to "yellow chin," is the Spanish name for another member of the pit viper family more commonly known as the fer-de-lance -- French for "lance head." This snake is identifiaed by a broad, triangle-shaped head, with gray or brown scales and black-edged diamond-shaped markings along its back. The barba amarilla reaches four to seven feet in length, and its bite can be fatal. 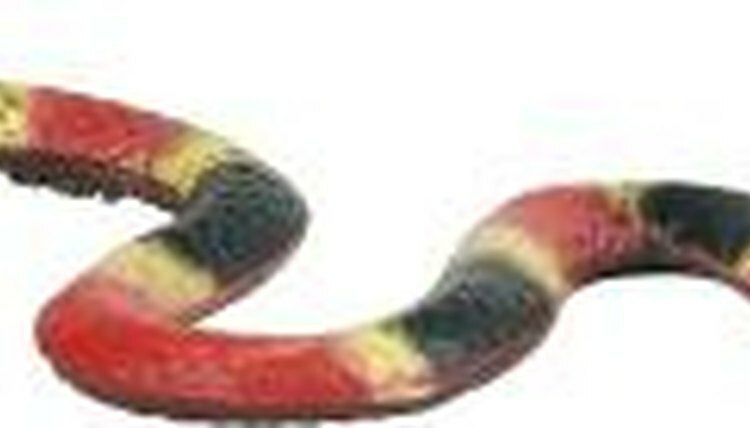 The coral snake is a common hazard in Honduras. Although there are about 50 species of coral snakes throughout the Western hemisphere, they are generally identified by their neckless, cylindrical bodies and red, black and yellow coloring. Although dangerously venomous, they are usually non-threatening if left alone. The Middle American rattlesnake is another pit viper commonly found in Honduras. As adults, these rattlesnakes grow to about four and a half to five feet, although they can reach nearly six feet long. Males are usually larger than females of the species. The coloring of these snakes varies and can be brown, gray-brown, reddish brown, yellow-gray, blue-gray, straw colored or even orange. Typically, they have diamond or rhombic-shaped markings in a darker color along their backs, although these are not always visible. The venom of these snakes generally causes nausea, pain, swelling, blistering and necrosis in humans. Fatal reactions such as systemic renal failure can happen, but are rare.